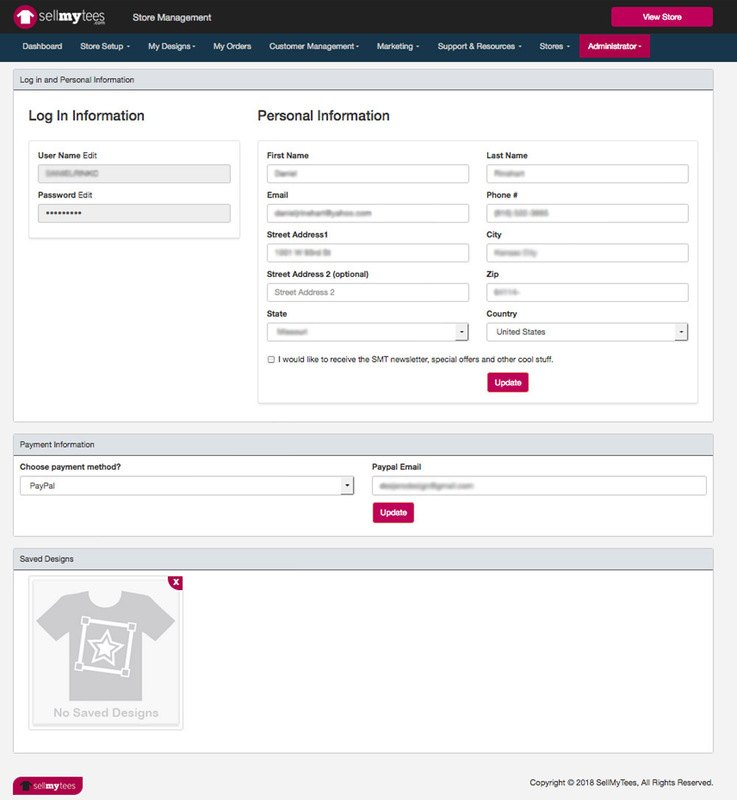 How does SellMyTees keep purchase information safe? What is the split when a shirt is sold? Where are shirts shipped from? White Smudgy Areas Printed On Design Why? Are colors on computer same as colors on shirts? Colors viewed on monitors vary. Shirts colors and ink colors viewed on the web site are a representation of what the final product will look like. SellMyTees strives to be as close as possible to what you see but cannot guarantee exact match. If you would like a sample of a product...blank or printed...before ordering, send us a message or give us a call at 1.800.659.2447. We will supply samples for marketing purposes and/or for stores to get an idea of the quality of shirt and print. You will receive a coupon code good for $3.00 off wholesale cost. Click HERE to view wholesale pricing. As an added value to store owners SellMyTees.com will pay the cost for domestic shipping. 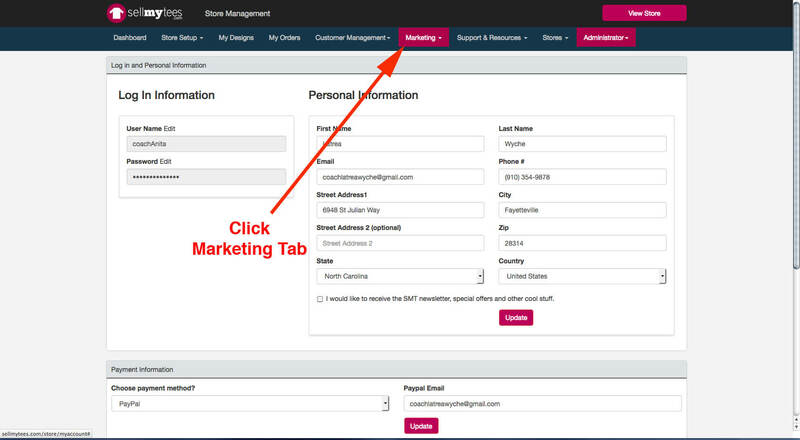 After requesting a sample you will be given a Coupon Code to enter on the 'Cart Page'. 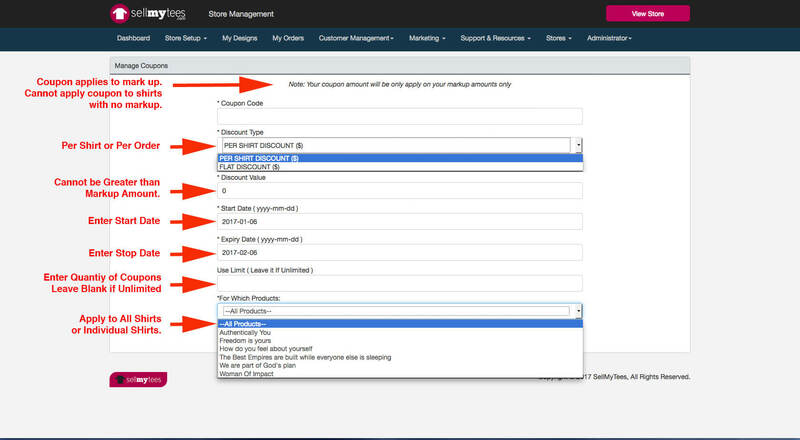 When purchasing the samples click 'SMT Factory Pickup' as the shipping which is located on the 'Checkout Page'. Can I have exclusive rights? SellMyTees strives to treat all affiliates store owners equally. SellMyTees is free to act in any capacity for any other person or organization interested in promoting, marketing and obtaining orders from members of the public for the purchase of their products over this web site, including any product that is the same as, or similar to, your products. 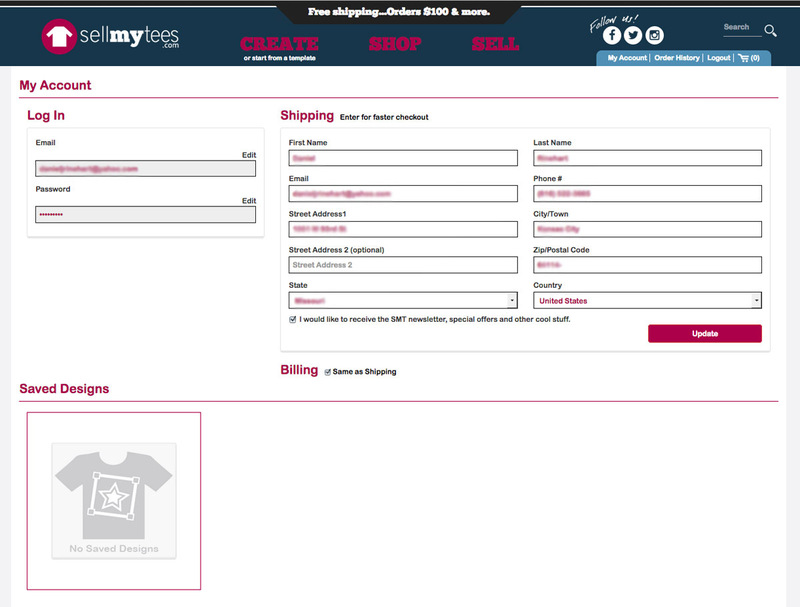 Yes...You can 'white label' the SellMyTees.com address through the company that supplied your url. For example...if you pruchased your url from GoDaddy go into your GoDaddy account update the setting. This can be done if you have Silver and Gold Level stores. Does SMTs give quantity discounts? SellMyTees offers discounts to the buyer by means of group rates and coupons. Group rate pricing is calculated by the quantity purchased at time of checkout. When a purchase is made from an affiliate store the mark-up price is added to the group rate price. The amount the store owner earns is not affected by the group order rate. At times SellMyTees will offer coupon discounts. Mark-up price is added to the discounted rate of the coupon and will not affect the amount the store owner earns. Coupons can be used for individual stores too. Coupons can be made as a percentage discount and be used for a single use or can be set up to expire on a certain date. Coupon discounts issued by the store owner is taken from the store markup price. 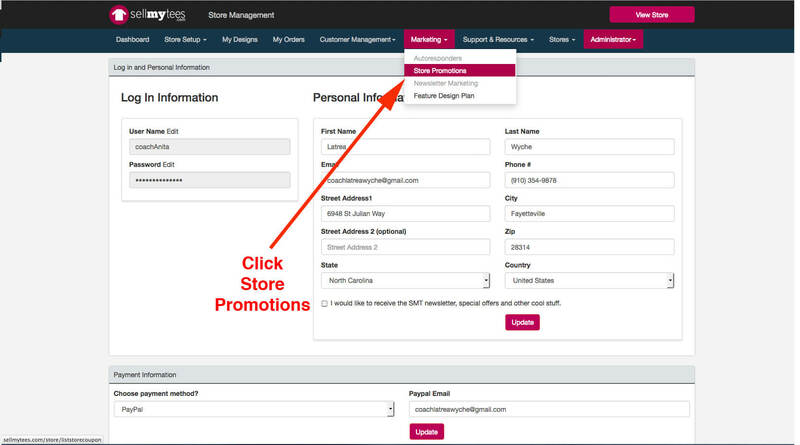 Store coupons can be issued by logging in to the store admin. Most design questions can be answered by reading our Help & Tips section or viewing Video Tutorials. In some cases designs are in an incorrect format, resolution is inadequate or too small in size. SellMyTees can recreate the design for you. Art fee for non registered members is $40 per hour however discounts are available to Silver and Gold level stores. If you need further help call a service rep at 1.800.695.2447. Office hours are Monday-Friday 8:00am-5:00pm (cst). To upgrade or cancel a store login to the dashbord of your store. 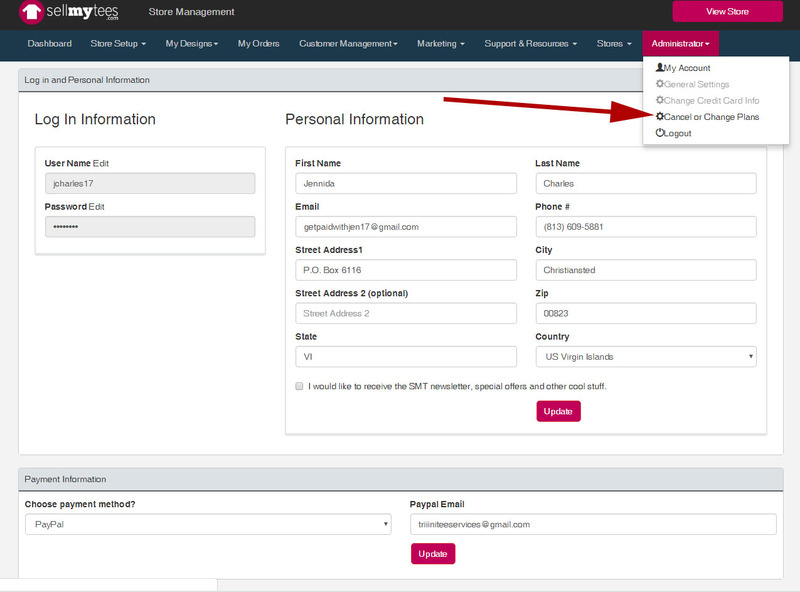 Select 'Cancel or Change Plans' located in the 'Administrator' tab. Select Silver, Gold or Cancel and briefly explain the reason for the change. If you are upgrading from Bronze to Silver or Gold you will be directed to enter the method of payment. SellMyTees uses Secure Sockets Layer (SSL) technology to safely protect the security of your personal information during transmission. All payment information submitted is processed immediately via trusted provider(s) in e-commerce security solutions. We do not store or retain credit card information on our server or databases. Indiana residents are be charged a 7% sales tax. One is the loneliest number...but that is all it takes. Coupon codes can be added to individual shirts or all shirts within a store. Coupon is based on markup amount so coupon cannot be greater than the markup. 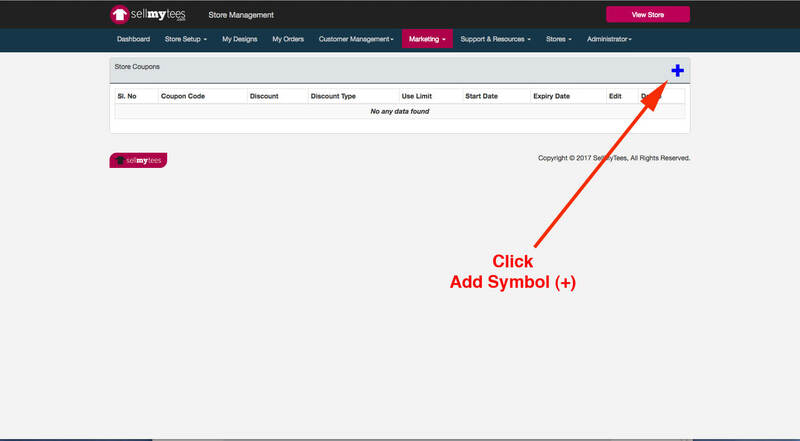 In the 'Design Management' page is where you can adjust the price of the shirt and choose which items are available for sale in your store. To close/cancel a store log in to your store dashboard. Click the 'Administrator' tab then select 'Cancel or Change Plans'. SellMyTees does not manually screen content before it is displayed on the website so occasionally members may inadvertently or deliberately submit and display inappropriate content. Inappropriate content includes, but is not limited to, content that infringes the copyright or other intellectual property rights of any person or company, or that defames or vilifies any person, people, races, religion or religious group, is obscene, pornographic, indecent, harassing, threatening, harmful, invasive of privacy or publicity rights, abusive, inflammatory or otherwise objectionable. Please help us by letting us know about any inappropriate, or potentially inappropriate, content you see on the website. You can do this by sending us a message via 'Contact Us' page located at the bottom of SellMyTees.com home page. Select 'Defamatory Content'' as the topic. Tell us the reason for the design being considered defamatory and a link to the design/content. If it is deemed to be defamatory the content will be removed or updated. Click HERE to go to the Contact Us page. If you need a SellMyTees rep to help you give us a call. We accept Visa, MasterCard and Discover as well as PayPal for online purchases. For your and our protection we screen all credit card orders for potential fraud. Please make sure that your billing and shipping addresses are correct to avoid delays with your order. If you prefer to place your order over the phone, please call us at 1-800-659-2447. Normal office hours are 8:00 am - 5:00 pm (CST), Monday - Friday. 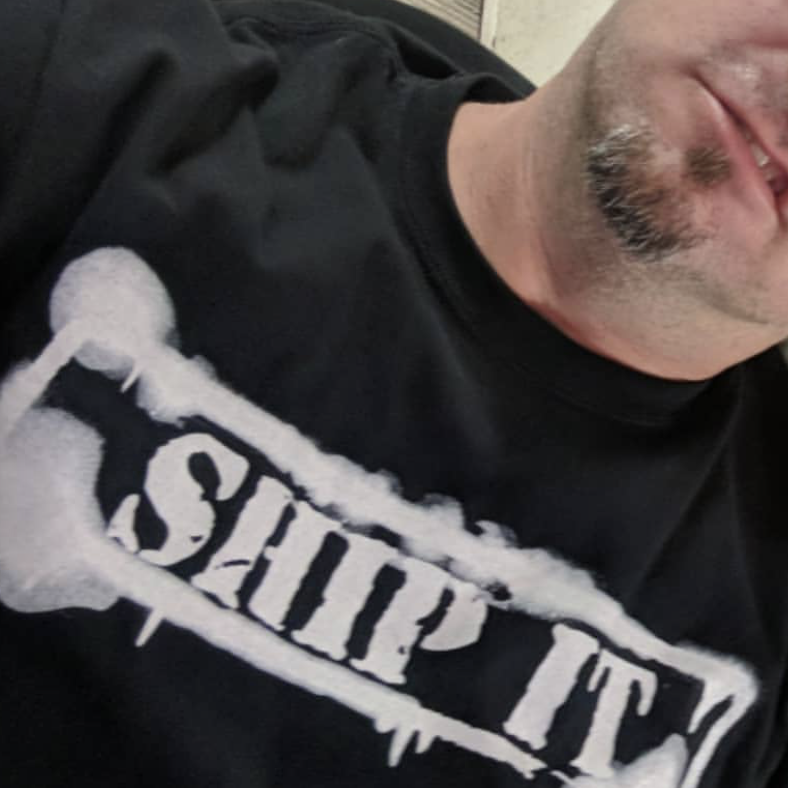 SellMyTees.com is one of the first companies in the world to print directly on shirts digitally...and that it the method used to print. Digitally printing directly onto shirts (sometimes referred as DTG...Direct To Garment) is pretty much like using a printer to print on fabric. It works much like a printer does to paper, it can support the most detailed design with as many colors as you want. Our machines print one garment at a time which makes it perfect for printinh one-off t-shirts. SellMyTees.com has perfected the way in which we print in order to produce high quality images as well as the system in which orders are processed. SMT is able to print one shirt at a time in as many colors as you desire at a low cost. SellMyTees.com production is located in town called Fort Branch outside of Evansville, Indiana. Look at this example of what was thought to be print machine error. Notice the 'smudgy' areas. Here is the design exactly as it looked before print. To the naked eye everyone would think what in the world happened to the 'glow' areas. Why the bad looking 'smudges'? Did not print at all like you would think it should. Problem is with digital printed art computers only understand what information is reads. Information (Data) In = Information (Data) Out. So what happened to this design? On all colored garmets (other than white) the print machine will initially lay down what's called a white base print and then print the colors (CMYK) and a 2nd white (highlight white). So anything that is white is basically printed twice so it will be a bright white and pop off the shirt. This design printed the 'smudge looking' areas because there actually is white in those places of the artwork. Albeit very light...it is there. The print machine will read and print anything it knows to be there...even down to 1 x 1 pixel at 10% opacity. A good prcatice is to check the artwork by placing a 1 pixel stroke on your layer. This will show you if there is any color in the art that cannot be visually seen on the screen. This way you can delete or erase the areas you do not want printed. Here is an example of what the design above looks like with a red stroke added. Pretty crazy...huh? So...use the stroke trick and your designs should always print exactly like you want it to print. Credit card settings are set at a high level. The address, zip code, credit card number, CCV code and expiration date must be exact. The address entered must be the address associated with the credit card. If the 'shipping address' is not the same as the address associated with the credit card then the 'billing address' must be entered with the credit card address.